Note Dane's recommendation for TCPView. It looks very useful! 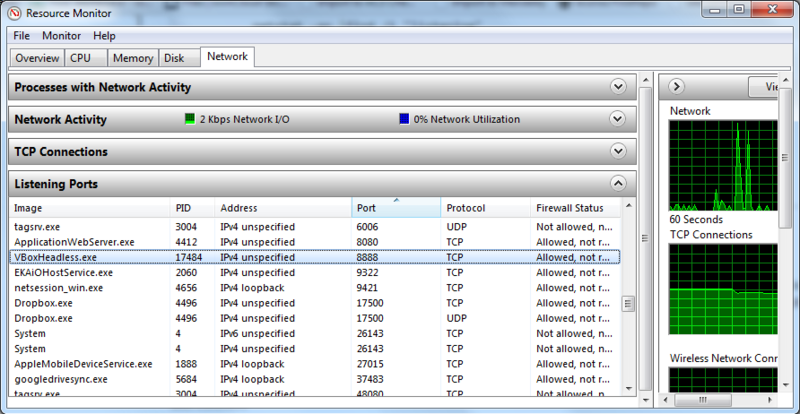 Use TCPView if you want a GUI for this. It's the old Sysinternals app that Microsoft bought out. The -b switch mentioned in most answers requires you to have administrative privileges on the machine. You don't really need elevated rights to get the process name! netstat -ano | findStr "8080"
tasklist /fi "pid eq 2216"
netstat -aon |find /i "listening" |find "port"
using the 'Find' command allows you to filter the results. find /i "listening" will display only ports that are 'Listening'. Note, you need the /i to ignore Case otherwise you would type find "LISTENING". |find "port" will limit the results to only those containing the specific port number. Note, on this it will also filter in results that have the port number anywhere in the response string. Open a command prompt window (as Administrator) From "Start\Search box" Enter "cmd" then right-click on "cmd.exe" and select "Run as Administrator"
Enter the following text then hit Enter. Find the Port that you are listening on under "Local Address"
Look at the process name directly under that. Note the PID (process identifier) next to the port you are looking at. Look for the PID you noted when you did the netstat in step 1. If you don’t see a PID column, click on View / Select Columns. Select PID. Make sure “Show processes from all users” is selected. for /f "tokens=5" %a in ('netstat -aon ^| findstr 9000') do tasklist /FI "PID eq %a"
where 9000 should be replaced by your port number. tasklist /FI "PID eq 5312"
You can now cross check by typing netstat command. It is very simple to get the port number from pid in windows. 1) Go to run --> type cmd --> press enter. 4) Then cmd will give you the detail of the service running on that port alongwith pid. 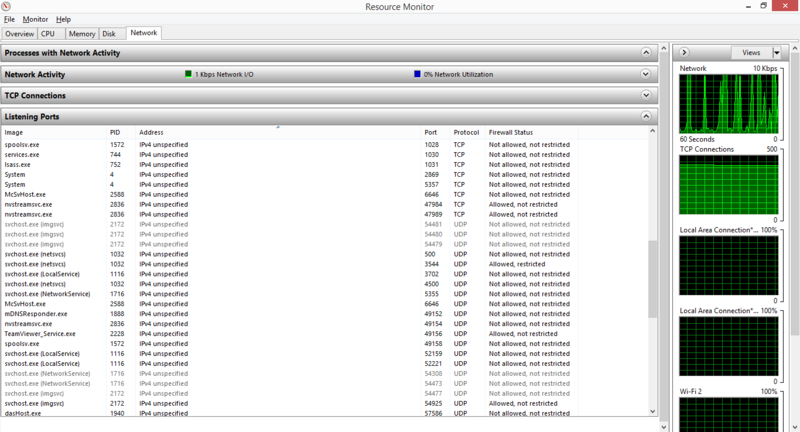 5) Open task manager and hit the service tab and match the pid with that of the cmd and that's it. netstat -a -n -o | find "123456"
If you'd like to use a GUI tool to do this there's SysInternals TCPView. With PowerShell 5 on Windows 10 or Windows Server 2016, run Get-NetTCPConnection cmdlet. I guess that it should also work on older Windows versions. The default output of Get-NetTCPConnection does not include Process ID by some reason and it is a bit confusing. However, you could always get it by formatting the output. The property you are looking for is OwningProcess. netstat -ao and netstat -ab tell you the application, but if you're not admin you'll get "The requested operation requires elevation". This answer was originally posted in this thread. I recommend CurrPorts from NirSoft. CurrPorts can filter the displayed results. TCPView doesn't have this feature. Note: You can right click a process's socket connection and select "Close Selected TCP Connections" (You can also do this in TCPView). This often fixes connectivity issues I have with Outlook and Lync after I switch VPNs. With CurrPorts, you can also close connections from the command line with the "/close" parameter. netstat -bano | findstr "7002"
Follow these tools :- From cmd :- C:\> netstat -anob with Administrator privilege. If you just want to know process running and threads under each process, I recommend to learn about wmic. Wonderful cmd line tool, which gives you much more than you can know. netstat -a -o This shows the PID of the process running on a particular port. Keep in mind the process id and go to Task manager and services or details tab and end the process which has the same PID. Thus you can kill a process running on a particular port in windows. Programmatically, you need stuff from iphlpapi.h, for example GetTcpTable2(). Structures like MIB_TCP6ROW2 contain the owner PID. So in this example tnslsnr.exe (OracleXE database) is listening on port 8080. Select-String is used to filter the lengthy output of netstat for the relevant lines. -Pattern tests each line against a regular expression. -Context 0,1 will output 0 leading lines and 1 trailing line for each pattern match. netstat -na | find "1234"
Use below batch script which takes a process name as argument and gives netstat output for the process. echo netstat for : "%procName%" which had pid "%1"
Not the answer you're looking for? Browse other questions tagged windows networking port or ask your own question. How to find which program is using port 80 in Windows? How to start mysql in xampp which is showing error? Node.js Port 3000 already in use but it actually isn't? Can two applications listen to the same port? How to find an available port?